The longest running open submission exhibition in the country, the RHA 183rd Annual Exhibition opens this May and runs through to the 17August. Over half the works in the exhibition are selected through an open submission process. As a result, this exhibition offers an unparalleled chance to view work by emerging artists hanging side by side with established artists and RHA members. With the majority of exhibited work for sale, it will provide a great opportunity for discerning collectors. This year the Annual will include work by, Donald Teskey RHA, Martin Gale RHA, Amelia Stein RHA, Una Sealy ARHA, Carey Clarke PPRHA, Mick O’Dea RHA, Michael Cullen RHA, Abigail O’Brien RHA, Kathy Prendergast, Alan Phelan, Janet Mullarney, Mary A Kelly and Alison Pilkington, among many others. There are, to date, 16 artists’ prizes contributing to a prize fund of over €50,000 and the Academy remains indebted to the many generous sponsors who make this prize fund possible. Prizes this year include the Hennessy Craig Scholarship of €10,000 awarded to a painter under the age of 35, The Ireland – US Council and the Irish Arts Review Portraiture Award of €5,000, the Curtin O’Donoghue Photography Prize of €5,000, the AXA Insurance Prize for Drawing of €5,000, the Gerry Torsney Prize for Portraiture in any Medium – €2,000 and the Friends of the RHA Prize of €1,500 for a Senior Artist. 28 May – 17 August 2013. Sarah Rogers, Red Riding Hiding, Two plate etching, 27 x 20 cm, Image courtesy of the artist. Carolyn Mulholland RHA, Peripheral, Bossi work on recycled marble, 18 x 80 x 4 cm, Image courtesy of the artist. Vera Klute, Portrait of Oliver Cummings, Oil on canvas, 30.5 x 20.5 cm, Image courtesy of the artist. Christy Keeny, Horse Power 2. Alison Keehan, Ostrich Feather in Blue Light, Oil on linen, 100 x 80 cm, Image courtesy of the artist. 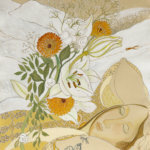 Pauline Bewick RHA, Fox and Flowers from Antoinette, Watercolour and acrylic on handmade paper, 79 x 58 cm, Image courtesy of the artist. Carey Clarke PPRHA, The Lie of the Land.